Come and experience winter magic gliding along leisurely with just the sound of your rhythmic movements across vast areas of mountain fields covered with crisp, unmarked, glittering snow. 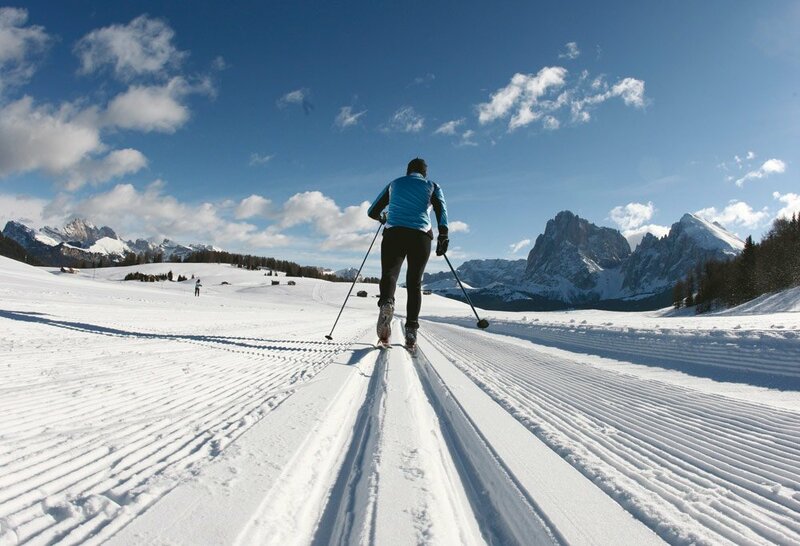 Cross-country skiing throughout Alto Adige is the perfect recreational winter activity that combines physical exercise and pleasure in the great outdoors. Cross-country skiing vacations in Velturno and vicinity will delight skiers with beautiful high mountain paths and kilometers of challenging trails to explore. Equipment rentals are available at the valley station of Plose Mt. cable cars. There are numerous snow covered trails extending their way throughout the snowy mountain area and plateaus in the vicinity of the city of Velturno. The highest cross-country trail in the Isarco Valley is the “Passo delle Erbe” trail. Situated at an altitude of circa 2,000 m above sea level, it offers double recreational entertainment with its section dedicated to cross-country skiing and its section dedicated to skating. On Plose Mt. you will find “Valcroce’s” 5 km long looped run beginning at the mountain station of the cable car. Far from the hustle and bustle scene, enjoy the solemn beauty of the Alpe di Villandro mountain pasture. “Rinderplatz” and “Foggoia” cross-country trails are fabulous trails than run cross snowy fields and through woods and forests. Take a break and step into any of the cosy hotels along way and sample the fine alpine cuisine.